NEW YORK – Young students in traditional costumes and with flower bouquets in their arms, welcomed His Beatitude Archbishop Ieronymos of Athens and All Greece, Sunday morning, May 19, 2013 as he arrived at the Archdiocesan Cathedral of the Holy Trinity in Manhattan for a hierarchical concelebration of the Divine Liturgy. 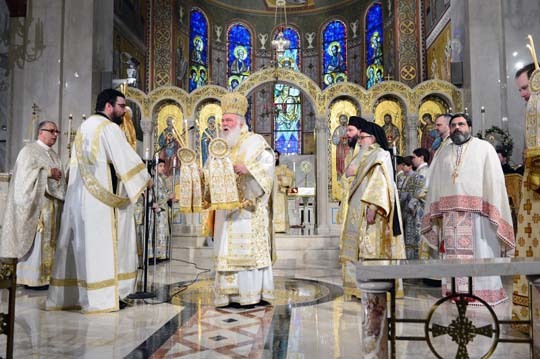 The Primate of the Church of Greece presided over the Liturgy and His Eminence Archbishop Demetrios of America concelebrated along with the two hierarchs from Greece who accompany His Beatitude, Metropolitan Chrysostomos of Messinia, and Bishop Gavriel of Diavleia and clergy from the Archdiocese of Athens and the Greek Orthodox Archdiocese of America. 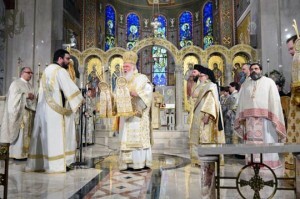 The Divine Liturgy was broadcast live by satellite through various outlets around the world, in Greece, the United States, Canada, Australia and in some European countries. Shortly before the dismissal, Archbishop Demetrios presented His Beatitude to the congregation and highlighted his long pastoral and philanthropic ministry, especially in the last few years, since Greece entered a harsh economic crisis. “You are heroically fighting an uphill fight, offering a great ministry, feeding daily and unceasingly for almost three years now, thousands of people in need”, said Archbishop Demetrios and asked the visiting hierarch to offer to the congregation the word of God. Archbishop Ieronymos, first thanked His All Holiness Ecumenical Patriarch Bartholomew and Archbishop Demetrios for his invitation to visit and be honored by Hellenic College Holy Cross School of Theology, visit New York, and have the opportunity to see and marvel at the strong and vibrant Greek Orthodox Community and its witness of Orthodoxy and Hellenism. Archbishop Ieronymos, in his sermon, about the gospel of the Myrrh Bearers, talked about the lost hope of Christ’s disciples and later the renewal and hope that come from the Resurrection of our Lord. He also said, that he feels pride and admires the young people he met at the Holy Cross School of Theology and elsewhere, because they gave him hope for the future of our people, no matter where they happen to be. “We are the kind of people who are builders, no matter where we go,” he said. At another point, His Beatitude talking about the sanctity of the Church, said that our future and continuation depends upon the preservation and continuation of this sacred space where the Divine Liturgy takes place and that if our faith diminishes, if our Greek Orthodox traditions fade then we should know that will loose everything, including our history and memory. After the service dismissal, Archbishop Demetrios presented to Archbishop Ieronymos an archieratical engolpion with the image of Saint Paul, the founder of the Church of Greece, made in micro mosaic art. He also presented the Archbishop of Athens with a check of one hundred thousand dollars especially for the social welfare work he does in support of children in need. In the evening, the Cathedral became the venue for a concert in honor of His Beatitude Archbishop Ieronymos of Athens and All Greece, titled “He is Risen!” The concert consisted of selections performed in two parts: the first by the Archdiocesan Youth Choir and the second by the Archdiocesan Byzantine Choir. Archbishop Ieronymos stated, he was very impressed by the performances of both choirs and said it was music he did not expect to hear in New York. The program was organized by Archdeacon Panteleimon Papadopoulos, the director of the Archdiocesan School of Byzantine Music.